Items and corpse retain their positions, which causes many corpses to appear embedded into walls. With Dark Fortresses, the bug happened when I wandered into hell. When I went back to the fortress to get back to the surface, the entrance had disappeared and I was stuck in hell. I had to load a backup save. Does this happen in all worlds or just a specific world? If it's a specific world, what DF version was it generated in, and can you upload it to http://dffd.bay12games.com/ [^] ? Turns out that it's even weirder that I thought. Apparently the layout changes based on where you approach the site from. 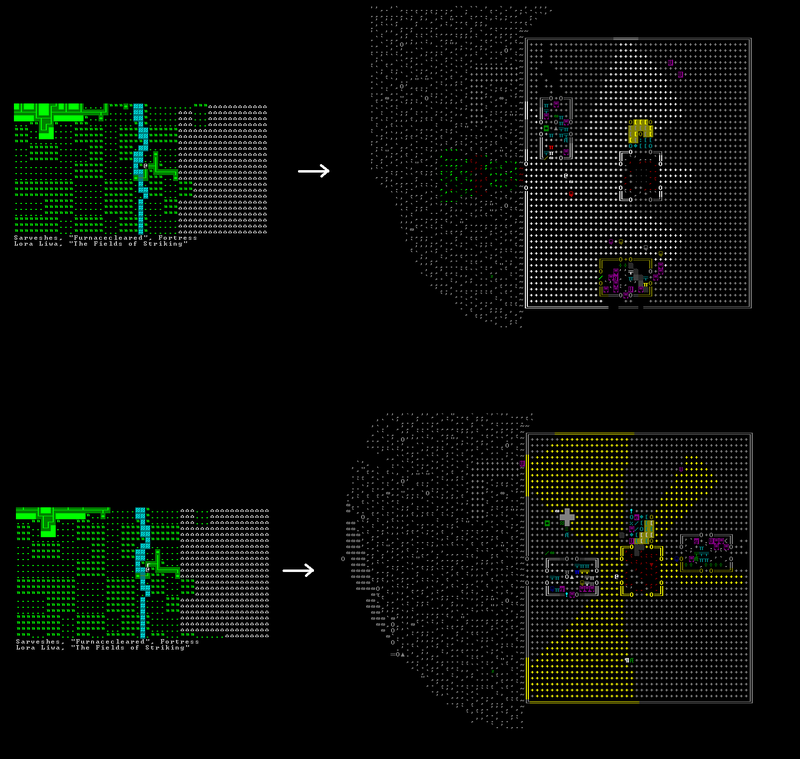 The layout of that worldgen dwarf fortress changes based on where you exit fast travel. Now that I pay attention to the screenshot, I realize that the fortress even changes stone type between versions. Ah, so that's that. I was wondering why is there a change in colouring, thought at first you maybe switched graphic mod. Now that I think about it the first time I saw the bug occur was in a Tomb. Gotta add that one to the list. - Depot and matching meeting/trade zone on the same side of central shaft. - Depot and meeting/trade zone on opposite sides of central shaft. This influences possibility of trade (see 0008350). Layout change also happened while sleeping in the fortress below. So 0006955 looks closely related to this one. I think so too, since sleeping kinda moves you back to the Fast Travel map (unloads/reloads the area). I resolved the instance in the save, which was caused by it not consistently picking the trees underground (which eventually caused the fortress generation to go off the rails when it hit those areas).